On November 15 2017, London’s QEII Centre hosted the annual Trust Conference – an event that brings global corporations, lawyers, government representatives and human rights pioneers together to find real solutions to fight slavery, empower women and advance human rights worldwide. In the seven years since its inception, the Trust Conference has grown significantly in terms of both participants and delegates, and its impact. The event needed to relocate to a purpose-built venue that could seamlessly house the scale of the event as well as taking the production value of the conference to new heights. AV would need to be completely bespoke, and catering would be tailored to both the needs of delegates and ethos of the event. For the QEII Centre, hosting such a prestigious global conference attended by human rights pioneers was a perfect fit for reinforcing the venue’s status as a stage for game changers and innovators, and a chance to showcase everything the centre has to offer. 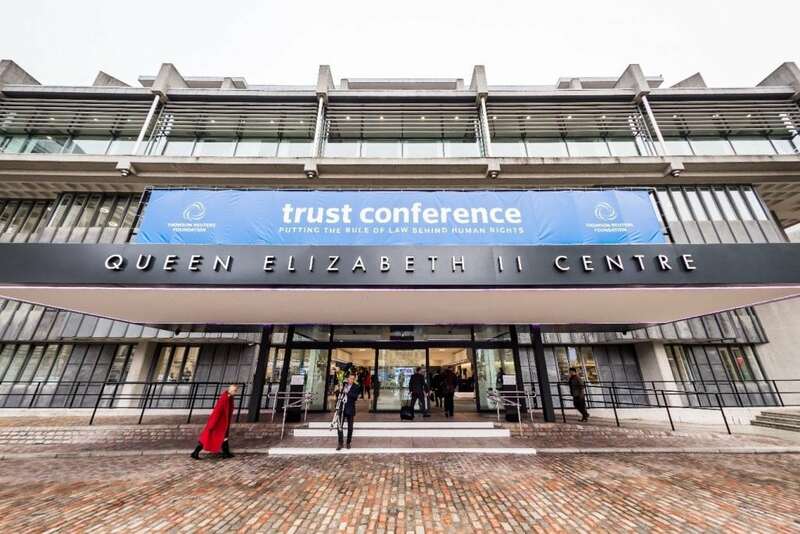 The Trust Conference used the QEII Centre’s flagship ground-floor conference space the Churchill for the plenary sessions of the event, and the connecting first-floor Pickwick for program relay from the main room, refreshments and a networking reception. Both spaces were completely transformed with bespoke lighting, 3D structures and Trust Conference branding. One of the keynote speakers of the event, world-renowned Chinese civil rights activist Chen Guangcheng, addressed the conference in Chinese and therefore required a simultaneous interpretation system which QEII was able to provide, using its on in-house facilities. The QEII Centre’s in-house catering team, QEII Taste by Leiths, worked closely with the event organisers to create a menu to meet their needs. Using their expertise of conference catering, QEII Taste were able to make recommendations on serving format that would facilitate better networking for guests as well as reducing food waste. 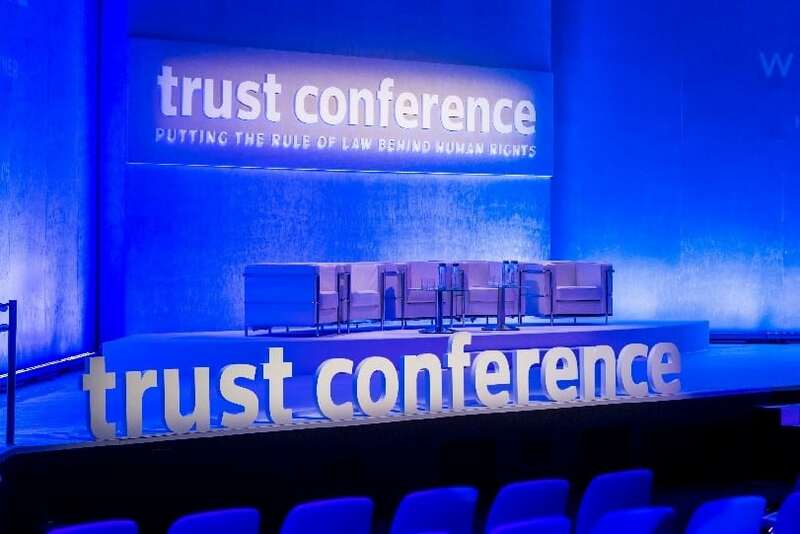 The Trust Conference 2017 was attended by 600 delegates from 60 countries, including representatives from government, law firms, NGOs and foundations, global corporations and media. QEII’s central London location provided the event with excellent accessibility by public transport, and international guests were wowed by being in the heart of London’s cultural landscape, with the event held against the backdrop of Westminster Abbey, Big Ben and the London Eye. Monique Villa, CEO, Thomson Reuters Foundation said: “The flexibility of the space and friendliness of the team made QEII an easy choice of venue for our event. Right from the booking stage through to the live show and post-event wrap-up, the entire QEII team made us feel as if we were their only client. It was their genuine enthusiasm for our event coupled with their attention to detail, strong communication skills and skilled delivery of a complex event that built significant trust and left us feeling in good hands.